PC Power Management Software, PowerStudio, is the best way to control power usage, reducing electricity costs and CO2 emissions with an ROI in 4 months. PowerStudio is an out-of-the-box, enterprise-level, PC power management software solution which, by applying centralized computer power policies, enables organizations to drastically reduce their electricity bills and carbon footprint, with no adverse user impact. Power setting for all PCs is flexible and dual tariffs can be accommodated to provide accurate usage and savings data. 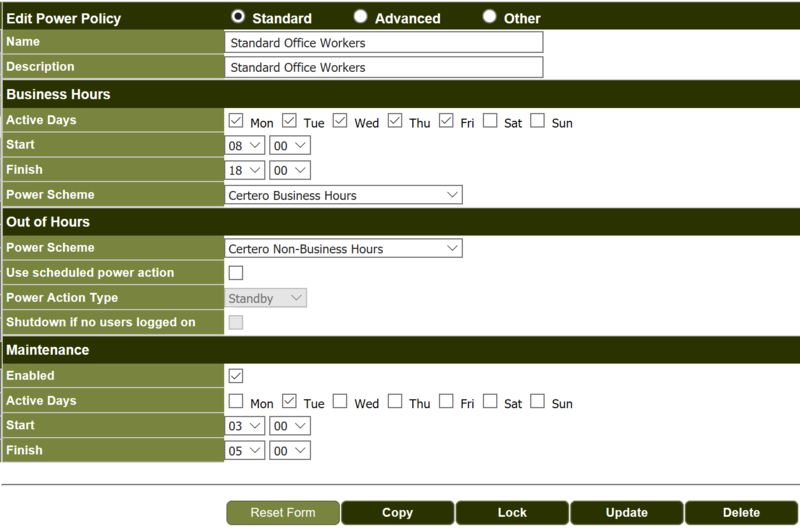 Profiles can be applied to address the specific needs of particular roles, thereby avoiding user dissatisfaction or reduced productivity (e.g. through unsaved work or time lost through re-logins). PowerStudio has no dependencies on any third party products (i.e. Microsoft SCCM) and can deliver an ROI in as little as four months. 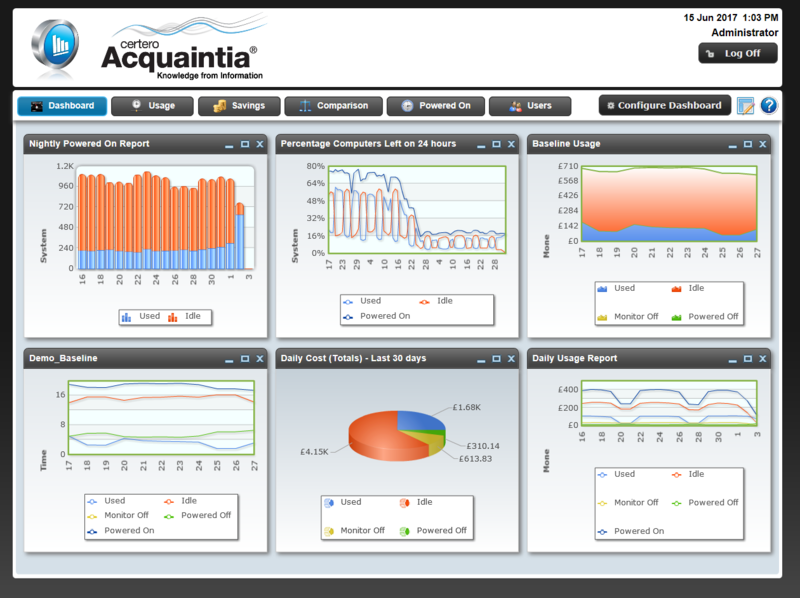 The customizable dashboard and business intelligence engine – Acquaintia – includes easy-to-understand-reports and graphs, making cost, carbon, energy and time savings quick and simple to establish. Maintenance Windows – Automatically wake the machine up to enable windows updates etc. The use of policies to pull all of these configuration items together makes it very simple to create a comprehensive power management plan that offers differing strategies for day and night. This allows organizations to enable users to work with no risk of interruptions but still achieve excellent savings by specifically targeting the savings against machines being left on outside of business hours. There are no restrictions as to the number of policies that can be created, so organizations are able to tailor them to the specific needs of all teams and departments. Schemes are a component of the policies which are used to define when a system should perform a power saving action. For example setting hibernate to 1 hour will ensure that PowerStudio will monitor the idle time on the device and when that time exceeds 1 hour it will place the device into hibernation. All of the schemes are multi-tier so a number of different power saving actions can be administered at different intervals, a classic is to turn the monitor off after 30 minutes of idle and then after another 30 minutes place the device into hibernation. Schemes are also able to differentiate between desktop and laptop devices so that different policies can be applied where required. Power saving policies can be applied to machines in a number of ways, one of the most streamlined approaches is to assign them based on the Active Directory (AD) Organizational Unit (OU). When a machine changes OU PowerStudio will automatically update the policy that has been assigned, so after the initial configuration our PC power management software will maintain itself. Policies can also be applied based on network location so that all devices within a specific building will have the same policy assigned, if the device moves to another location then its policy would be updated accordingly. PowerStudio relies on a client to be installed on the device which takes full control of power management. The deployment of the client is easily facilitated from directly within the PC power management software, removing the need to rely on 3rd party solutions. Once the client is installed, it starts to record all of the utilization by tracking metrics such as Idle time, used time, logged on user etc. All of this information is passed to the PowerStudio server on a daily basis so that it can be collated and included within the reporting. A high-level inventory is performed by the PowerStudio client to obtain the hardware specifications, this is then used by the PC power management software to accurately monitor the energy consumption as different makes and models of devices all use different amounts of power. Acquaintia provides a number of out-of-the-box reports which enable energy managers to gain full visibility of the power saving activities that are being driven by PowerStudio. All of the reports are configurable through a number of criteria and options making it easy to pinpoint where savings are being made and how to make further improvements. All of the reports can present the information based on financial, time, kilowatt hour, and carbon based values. Users are able to save reports and add them to their chart dashboard making them instantly accessible as soon as they login. Want to Understand Your ROI? Certero is the leading supplier of PC power management software to the NHS, with PowerStudio being used across hundreds of thousands of PCs leading to a dramatic reduction in electricity bills and carbon emissions. Think what we could do for your organization. PowerStudio has been awarded two prestigious awards: the Building Better Healthcare award recognizes the PC power management software’s ability to drastically reduce carbon emissions and the 2degrees award for short-term payback highlights the solution’s fast ROI.